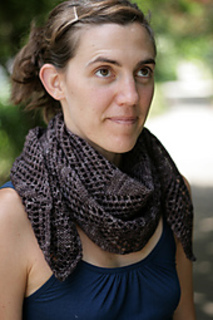 Originally published as the September 2011 pattern for the Twisted Shawlette Club. Pattern will be available to non-club members on December 1, 2011. Pictured yarn color will be available to non-club members on March 1, 2012. You’ll feel wise indeed draped in Sesheta, a triangular shawl with an open mesh lace pattern. Named for the Egyptian goddess of knowledge, writing and mathematics, Sesheta displays strong geometric symbols, with triangle and pinwheel designs down the spine and around the hem. Knit from side to side, this lacy shawl only takes one skein of yarn to complete, allowing you to make intelligent use of your stash!